The most common use for tablature is for guitarists and bassists to learn popular tunes without having to read standard music notation. Therein lie the pros and cons of tablature as it conveys the logistics of which note or group of notes is played and on which string or strings, but it does not convey the rhythm. Tablature works best for music the student has already heard or for things like scales or arpeggios that can be played with many rhythms. Every guitar tab has a staff consisting of six horizontal lines that correlate with the six strings of the guitar. The tablature staff's lowest line represents the sixth string, the low E string, and the strings progress upward from that point with the A, D, G, B and high E string. This provides the basic format for a tablature staff. Learn and play the open strings and memorize the lines of the tablature staff. Learn and play the notes in the first position. For facility as you learn them, increase tempo. 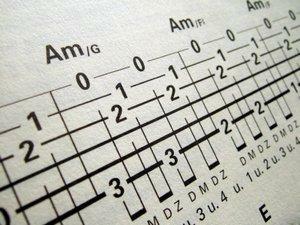 Learn and play a simple melody using tablature. This melody is Ode to Joy from Beethoven's Ninth Symphony. Learn this basic chord progression using tablature. The language of music is vast and deep. Tablature is but one useful tool along the journey of learning this wonderful language. Use it to learn and share simple, fun musical ideas including popular tunes and riffs and even more complex concepts like scales and arpeggios for technique and improvisation.